Spanish translation of your content will allow you access to all these countries. 1. The Internet is not just for English-speakers anymore. When the Internet began, it was created by English-speakers for English-speakers. The majority of early web users were computer buyers with Internet access, meaning that they were from first-world countries and primarily spoke English. However, today computer use has spread worldwide to other countries as technology has become more commonplace, even in struggling nations. With this spread, the Internet use of the traditionally English-speaking countries has flat-lined, while nations with other official languages have increased their access. It is estimated that more than 935 million people identify a native language other than English. This includes those nations that primarily operate in Spanish. Having the Spanish translation of your content will allow access to them. 2. Becoming a multilingual business brings you new customers. Only about three percent of the current Internet content is available in Spanish. Spanish translation will expand your message to the Spanish market, and your business will gain new customers. This is common sense. With an English website, you can only reach potential customers who speak English, ignoring thousands of people who could be interacting with your company. However, you can reach those people with business expansion into other languages. This alteration has the potential to translate into thousands of more sales for you and your company. 3. The Spanish population is the third largest in the world. It has been documented for the past several years that the Hispanic population in the United States has been rapidly expanding. In fact, this increase is faster than any other minority group in the country, with experts estimating that a quarter of the United States’ population will be Latino by 2020. By translating your content into Spanish, you will not only reach this increasing market in the United States, but you will also be able to tap into the third largest population in the world. Following English and Mandarin Chinese, an estimated 425 million people throughout the world speak Spanish as their primary language. Spanish is also the most common second language for the international population. This means that an additional 60 million bilingual people have adopted Spanish as their second language. This is a massive population that your business is not currently reaching with your English-only materials. By completing a Spanish translation of your company’s content, you can access this enormous pool of potential customers. Spanish is the official or co-official language of more than 20 countries worldwide, including Spain, Mexico, those in Latin America and most of those in South America. In addition to these traditional Spanish market nations, there are large Hispanic groups located in countries such as Morocco, the Philippines, Australia and Western Europe. With the Spanish translation of your company’s website and marketing materials, the business expansion possibilities are massive. 4. 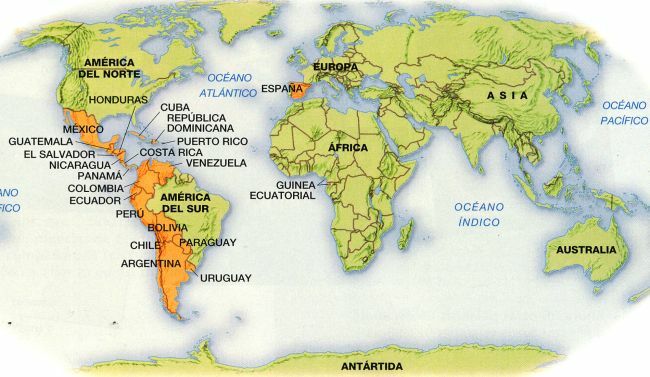 The United States is making free trade agreements with many Spanish-speaking nations. Recognizing the buying power of Hispanic populations, the United States has recently been establishing free trade agreements with many Latin countries. In 2005, the country signed the Central America-Dominican Republic-United States Free Trade Agreement (CAFTA-DR) with Costa Rica, Guatemala, Dominican Republic, Nicaragua, El Salvador and Honduras. The following year, similar agreements were created with Colombia, Peru, Panama and Chile. Continued talks have created bilateral agreements with Ecuador, Argentina, Brazil, Uruguay and Paraguay. Since the United States is already tapping into the Spanish market, it makes sense that you should consider Spanish translation as an integral part of your business expansion plan as well. 5. You can get ahead of the competition by building trust and brand recognition. Many companies are beginning to see the power of the Spanish market. By enabling a Spanish translation of your website, user manuals, brochures and other marketing materials, you and your business can get ahead of the competition. Customers are most comfortable doing business with websites and companies that are written in their own language. If they have to translate the content into their native tongue, they are less likely to interact with that business. In fact, approximately 50 percent of business on the Internet is conducted in a language other than English. When you offer your company’s advertising and technical support in Spanish, you are reaching the Hispanic population in their own language. This will create an atmosphere of trust and collaboration that will give you the advantage over many of your competitors. In addition, having your website in Spanish will give you the edge in other countries because of the way search engines operate. Many nations utilize locally created search engines rather than Google or MSN, and these native search engines are run in the official language of the country. This means that nations that speak Spanish will search websites written in Spanish. If you want your site to appear on these local lists, you must provide your content in the appropriate language to meet the Spanish market. The global market is becoming smaller and smaller thanks to the ever-increasing accessibility of businesses all over the world with just the click of a mouse. Proper marketing of your company begins by reaching foreign customers in their native languages. If you want to experience international business expansion, you must consider Spanish translation of your materials, including your website, product information and customer service. Link Translations has all the knowledge and resources to get your content of all formats localized into Spanish. By making the move to include the Spanish market now, you will have a distinct advantage over many of your competitors who may be slower to make the transition. Becoming a multilingual business will soon become the norm for most companies, but you have the opportunity to begin the Spanish translation of your business now and become a leader in your market.